Note : Our shop YLMTech-Design Retro Mini are genuine product , it's English version, all other products sold under our listing are not authorized by our company , it's not English version . Please buy them carefully. Retro Mini Game Console With 40 GBA Games Built In Retro Mini，A Free TF Card Containing 508 GBA Games. Barrier-Free Connection Between Lattice Of LCD Screen And Game Running System，High Definition Picture Of The Game，No Caton. 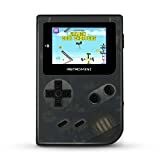 2 Inch High Definition Display Screen（240×160）, 1020mAh Battery Support 6 Hours Of Game Time，Retro Mini Provide A Card Slot To Support SD Card，Highest Support 32G TF Card. If You Find The Bubbles Or Scratches On The Screen After Receving The Retro Mini，Just Tear Of The Screen Protection Film.